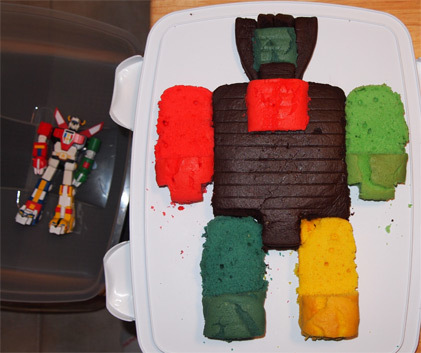 On Second Scoop: Ice Cream Reviews: Who wants a slice of Voltron cake? 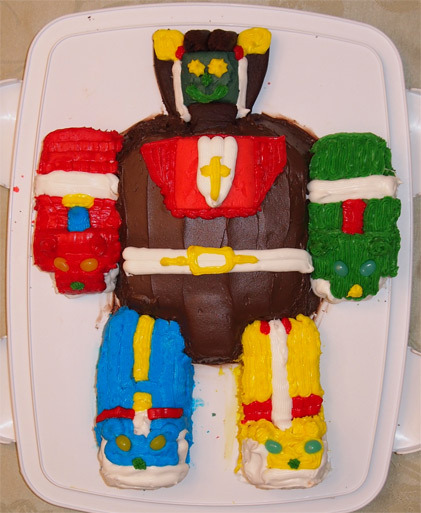 Who wants a slice of Voltron cake? You know how I tend to try too hard when I make cupcakes or cookies? Yeah, well, I apply that same over the top philosophy to cake baking, too. 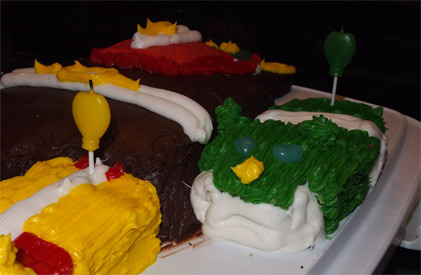 A quick Google image search only reveals this frosted Voltron and this fondant Voltron. Let's see if we can't add a third Voltron to the mix. Disclaimer: Look, I'm not pretending like I'm some skilled cake artist here. In retrospect, I can think of at least a dozen things I did wrong or could have done better. That said, it was just meant to be fun and different and one of a kind. Birthday cakes are a special thing and should be treated as such. Just use your imagination and the person that you give it to will appreciate it. Now, Children of the 80s unite! This is my tasty buddy Voltron. Well, he was my buddy before we ate him. I'd say he came out more fun than accurate. 4 tubes of cake icing and 8 jelly beans for the eyes to complete him. I've messed around a little with cake decorating before, but nothing that was ever this elaborate. (note: The white frosting is "fluffy white" and was pretty runny). The good allergy news is that he's nut free, dairy free, and egg free. and vanilla arms and legs (courtesy of some food dye and tiny disposable baking tins). I looked over at the cake and realized the Green Lion was smiling. Like I said, I could have done a bunch of things differently like make my own frosting which would have been easier to work with and resulted in a neater and cleaner cake. Also, I would have given him his wings and made his face look a lot fancier. That said, he's still cute, he serves twelve, and we will all miss him. Well, that's just flat impressive! I think it's adorable! I could never have done so well. I'll bet your kids loved it.